Mary Margaret McBride was born a Missouri farmers daughter in 1899. Her earliest education was "disorganized" because the family often relocated, but she entered a preparatory academy at the age of six and at 16 entered the University of Missouri. She earned her journalism degree by the age of 19. 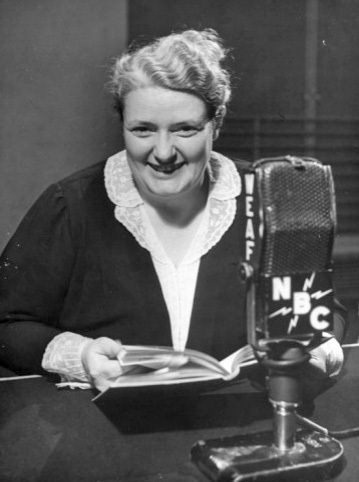 McBride enjoyed reasonable success as a "girl journalist" with the Cleveland Press and later the New York Evening Mail. For a time, she did quite well contributing freelance pieces to periodicals, but when the Depression hit she was one of hundreds of writers who found themselves unemployed. In her mid-thirties with her career essentially over, she went for a radio audition. From the time she first sat down in front of the microphone she felt at home, and didn't leave for 20 years. Mary Margaret's interviewing style set the style for later personalities like Oprah Winfrey, Mike Wallace, Terry Gross, and Sally Jesse Raphael. McBride's guests were a "Who's Who" of the mid twentieth century, from the Mayor of New York, to Pearl S. Buck, to burlesque queens, to ex-cons, to civil rights workers to teachers and authors. Appearing on Mary Margaret McBride's show meant that a celebrity was going to be greeted as a friend, which reflected McBride's extensive preparation. Author's especially knew that Mary Margaret would have been up the night before their appearance, reading their book and would be prepared with engaging and insightful questions. She is honored with a star on the Hollywood Walk of Fame at 7018 Hollywood Blvd. Be the first to comment on "Mary Margaret McBride"